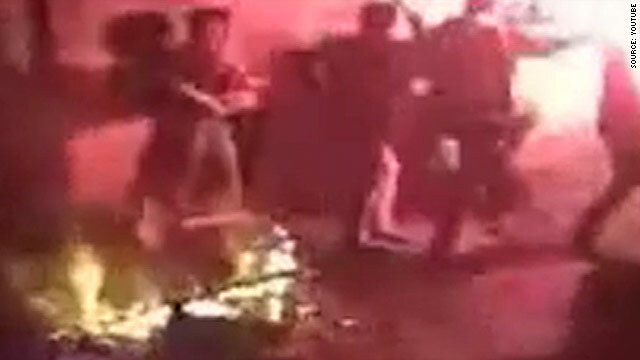 Video posted on YouTube shows young men dancing around a bonfire in the street in the lead up to the Iranian New Year. Tehran, Iran (CNN) -- Iranians marked a holiday that leads up to the Persian new year under the watchful eyes of police Tuesday night after the Islamic republic's supreme leader tried to discourage the celebrations. Thousands of people turned out, some in groups as large as 400 people, to dance, listen to music and light bonfires in side streets around Tehran on the festival of Chaharshanbe Soori. But unlike other holidays in recent months, there was no immediate sign that the observance was becoming a platform for protests against the country's leadership. Parties continued into early Wednesday, including one in the northern neighborhood of Zafaranieh where about 150 people danced to music pouring out of cars in the neighborhood. Some revelers played cat-and-mouse games with police who roamed the streets, looking to break up ongoing celebrations. Ayatollah Ali Khamenei, the country's supreme leader, had urged Iranians to ignore Chaharshanbe Soori, an ancient festival held on the eve of the last Wednesday before spring. It dates back thousands of years and leads up to Norooz, the holiday that begins with the first day of spring and the Persian new year, which falls on Saturday this year. In a statement published by Iranian news sites, Khamenei said the festivities have no basis in Islam, and can cause "harm and corruption." "It is appropriate to avoid it," he said. Watch YouTube video of revelers in Tehran shouting "death to the dictator"
Iran has been wracked by anti-government demonstrations since the disputed June 12 presidential vote that resulted in the re-election of hardline President Mahmoud Ahmadinejad. The government has beefed up security to ensure "order and calm" during the two-week period celebrating Norooz, stationing 200,000 security personnel across the country, according to Ahmadinejad's official news site. Tuesday's celebrations were closely monitored by police in Tehran, with officers randomly stopping and searching cars around Mohseni Square and other major streets and plazas. In one case, brief clashes broke out late Tuesday between revelers and plainclothed members of the Basij, the pro-government paramilitary militia, who chased them away with batons and stun guns. And in one eastern Tehran neighborhood, security forces spray-painted passing cars from which motorists were tossing firecrackers. Police at checkpoints around the city were looking for the marked vehicles. A video posted on YouTube showed what the poster said was an anti-government protest in another Tehran neighborhood, where protesters could be heard chanting "Death to the dictator." Earlier in the week, the chief prosecutor in the eastern city of Mashad warned that those who engaged in "disruptive behavior" during Chaharshanbe Soori would face "strong consequences." It's a precaution that's become increasingly commonplace in Iran, especially in advance of holidays, as the government continues to warn against political demonstrations that have emerged since last summer's disputed presidential elections. The Iranian government quashed anti-government protests that brewed in February as the nation commemorated the 31st anniversary of the Islamic Revolution, which marked the end of the country's Western-backed monarchy and the start of an Islamic republic. In the days that led up to the February 11 holiday, the government mobilized security forces and heightened its warnings, saying it would arrest protesters and hold them until the end of Norooz, on April 9. Six protesters who were arrested in December on the Muslim holiday of Ashura were sentenced to death on Monday, the day before Chaharshanbe Soori, the semi-official Fars News Agency reported Monday. Their sentences are being reviewed by an appeals court, Fars said. Another 86 people were found guilty Tuesday of acts against the Islamic republic, Iran's semi-official Fars News Agency reported. The Revolution and Public Court of Tehran said most of the defendants were given prison sentences. Meanwhile, around 350 inmates at Evin prison have gone on a hunger strike to demand that their cases be examined before Norooz, saying their ward is so overcrowded with recent political arrestees that prisoners are in poor health, according to the Committee of Human Rights Reporters, an Iranian group. Eyewitnesses in Iran said thousands of riot police and security officers lined the streets of the capital, Tehran, and patrolled major intersections on motorcycles and on foot Monday night. Beginning Saturday, police also have set up checkpoints along major roads in Tehran, and vehicles have been stopped and searched from late at night into the early morning hours, witnesses said.